July 11-15, 2016 from 9:00 A.M. to 3:30 P.M.
TRANSFORM YOUR SUMMER FROM ORDINARY TO EXTRAORDINARY! – Design and Eco-Adventure Park and More! EXPERIENCED LOCAL EDUCATORS WILL BE LEADING THE HANDS-ON FUN. 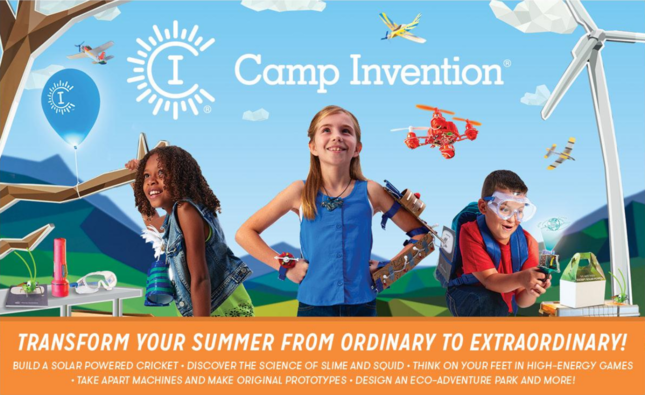 Visit www.campinvention.org or call 800.968.4332 today to learn more and secure your spot!